Hello, everybody! It's Broni here with you today and I thought I'd show you another mixed media card that I had a lot of fun creating. 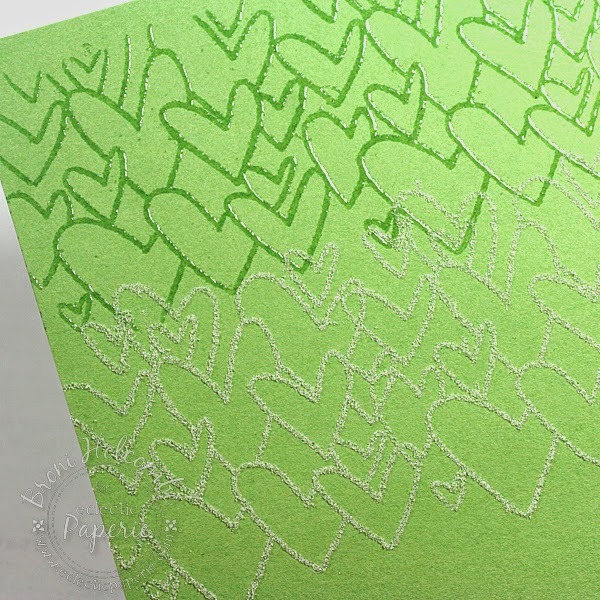 I started by stamping my small hearts background stamp from the Catherine Scanlon Random Shapes stamp set using Versamark ink onto my green cardstock. Then I heat embossed it with clear embossing powder. You can see that I did a row at a time. Next, I stamped the same image in Archival Jet Black ink onto my panel of watercolor paper. Then I taped off everything around the LOVE word of the Catherine Scanlon Follow Your Heart stamp using some washi tape. I inked it with the same black ink and peeled the tape away so that I only got the LOVE when I stamped. 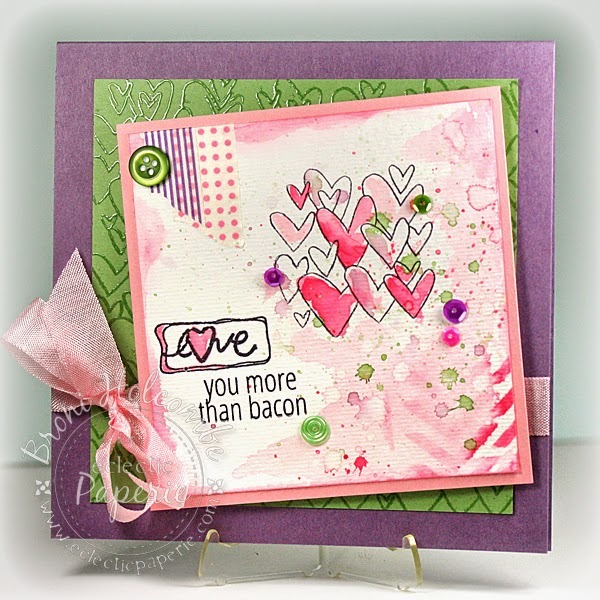 I added the "you more than bacon" from an Avery Elle stamp set, then I adhered some pieces of washi tape and sponged some chevrons on using my Mini Chevrons stencil, Distress Worn Lipstick ink, and a large sponge dauber. 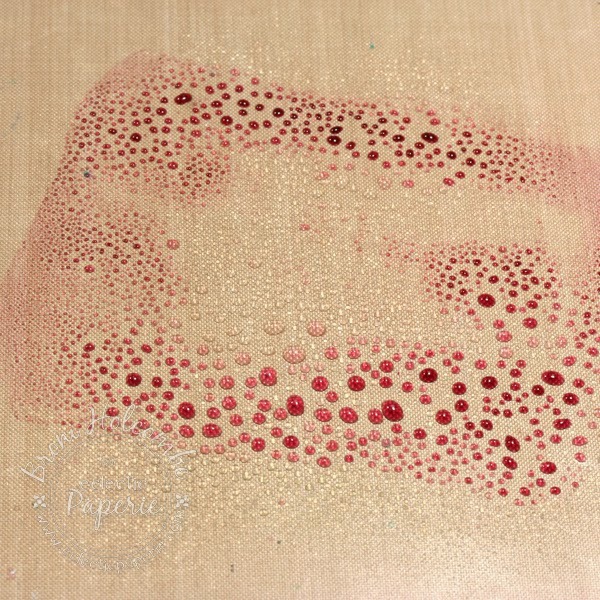 In order to do some water coloring, I smooshed my Worn Lipstick ink pad onto my craft sheet, then spritzed it with water. I used my water brush to color some of the hearts and to lightly color the background. I also flicked on some of the green and purple inks with my water brush as well. There you have it! Super easy and super fun! I just love mixed media cards! Love the way it came out. Beautiful and creative! How cute that card is Broni, adore the way you created with the hearts and love the sentiment!! Such fresh colours! 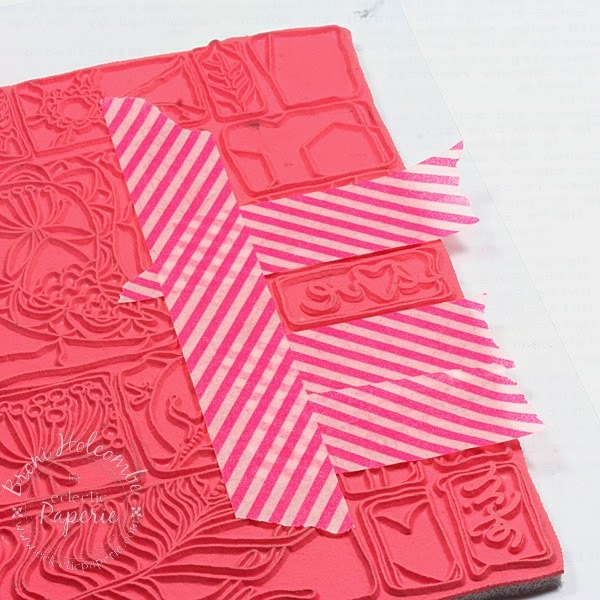 Love the way you mixed and matched your stamps. Love your card Broni and the sentiment is so fun. Terrific color palette too! Beautiful color combo and very funny sentiment! Love this card! Thanks for the details about how you created the card...I want to start watercoloring and I think this is one technique I could start with right away. Awesome posting! A beautiful and delightful card. How fun Broni! 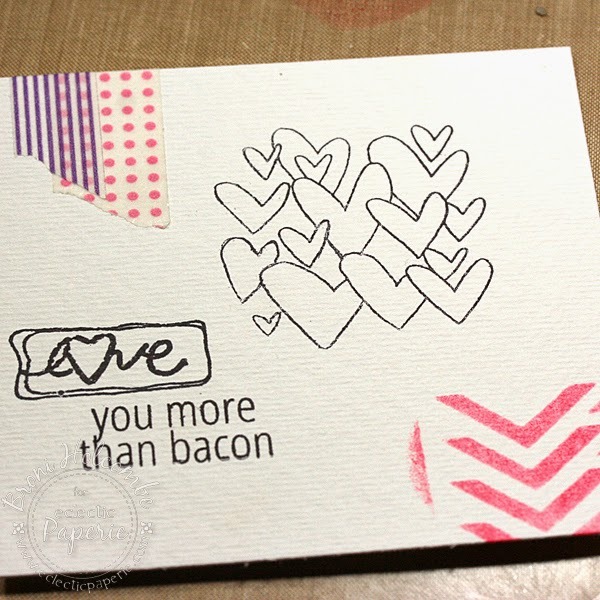 that bacon sentiment cracks me up - they must love that person A LOT if it's more than bacon!!! LOL!! The watercoloring wash came out super on this! so bright and springy! Gorgeous card Broni, love how you did the background!!!!! And how you incorporated washi tape. LOve it.